A hot spinach artichoke dip with a deliciously cheesy, creamy texture. 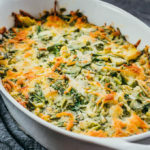 Made with artichoke hearts, fresh baby spinach, and shredded cheeses, all baked together in the oven. Low carb and keto friendly. Drain the can of artichoke hearts. Using cheese cloth or a tea towel, squeeze the artichoke hearts until very dry. Chop the dried hearts. In a large mixing bowl, add the chopped artichoke hearts, 3.5 ounces of mozzarella cheese (reserving the rest for later), and all other ingredients. Stir until well-mixed. Transfer to a 1.5 quart or larger baking dish. Evenly sprinkle the remaining 0.5 ounce of mozzarella cheese on top. Bake at 350 F until the top is golden brown, about 35 minutes. Serve while hot.